Secure Disk - hard drive and flash memory encryption. Pre-boot authentication and encryption of the whole drive, including the system files, gives this software superiority over similar products. NexyFILES 1.0 - Discover the full power of your phone with easy to use interface to transfer files between your PC and mobile phone. Download shots you've made on your phone, upload MP3's, ringtones, themes. CloneSensor 2.01 - It is a software program for searching duplicate file. It has ultra fast searching speed with special optimized algorithm and provides a lot of batch processing commands to help you find and delete duplicate files. 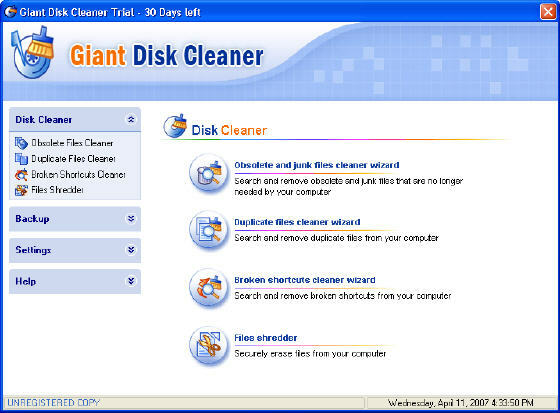 Disk Space Clean Clear 8.0 - Clean your hard drives and find over 81 types of thousands of junk files. It clears I.E. Cache, history and typed URL's in Internet Explorer 4.0 and above. CyberScrub cyberCide 2.5 - Delete ALL Data from Hard Drives; Secure Erasure Beyond Recovery; Essential for HIPAA, SOX Compliance; Ideal for Return of Leased Assets and Computer Disposal. 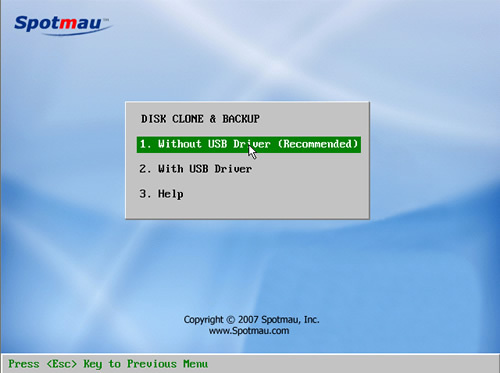 Spotmau Disk Clone & Backup - It can clone Windows 98, ME, NT, 2000, XP, 2003 and Vista and provides all kinds of clone options: Disk to Disk, Disk to Image, Disk from Image, Partition to Partition, Partition to Image, Partition from Image. File Server Migrator - a powerful and comprehensive data migration solution that automates the copying of data between Windows NT/2000/2003/2008/XP/Vista servers without agents or scripts. Acronis Disk Director 9.0 - A complex program that can reorganize your PC for better performance and data protection, including partition and boot managers and hard disk data editing tools. CD Anywhere 1.00 - Create disk images from CD-ROM and Video DVD medium, to build virtual CD drives and to burn CD image file to physical disc. Disk Space Inspector 3.3.2 - A tool for disk space usage analysis, management and reporting, creating disk space reports as text file (HTML, CSV, XML) or image files. DiskInternals Uneraser 2.3 - Recover any deleted file, including documents, photos, mp3 and zip files, or even folders and damaged disks, even data lost caused by a virus attack. PerfectDisk 7.0 - Defragment large and complex environment by optimizing virtually every file on the system, including all metadata, paging files, and directories. Paragon Partition Manager 7.0 - Enhance computer performance, convert operating systems, defragment partitions, optimize hard disk partitions cluster size, and so on. RepairDisk Manager 2.0.013 - Maintain up to date copies of repair disk files, automates the process of creating emergency repair disks. Super Utilities 5.85 - A megamart of system-maintenance tools designed to keep your computer running smoothly, cleaning your Registry, removing spyware infestation, etc. 7tools Partition Manager 2005 - Reconfigure partitions, repartition hard disks on the fly, and improve storage performance. Dekart Private Disk 2.06 - Create encrypted disk partitions to keep your private data secure, hiding your programs and data, and restricting access to them. Dekart Private Disk Multifactor 1.22 - A smart disk encryption tool that provides 100% protection of private information, protects your critical business and financial data. Disk Clean Wizard 1.3 - Find and remove temporary files, recognize and delete more than 50 types of junk files to clean up your disk. PARAGON DISK WIPER 5.0 - Wipe out any kind and size of hard drives, any OS, program files or data on your system to keep your secret away from others. All Image 1.2.2 - Create image files of any disks and back, and create bootable USB Flash Drives to use instead of bootable floppy disks. Floppy Image 2.3.2 - Create image files of floppy disks and backup, and enable to add descriptions to or convert your old image files. Remove Old Files 2.01 - Clear folders of old files, daily or monthly archiving old files to make you system clean. 10-Strike SearchMyDiscs 2.3 - Create your own CD/DVD database and disk cataloging, search files on your disks fast and easily and organize CD and DVD collections. 7tools Partition Imager 2005 - Backup your documents and system to secure your PC against system crash, virus attack or casual unstable application.